If you have landed on this page to know the difference between Google Analytics and Kissmetrics, chances are you may be looking for a tool that will answer more complex questions. It’s been more than a decade since Google Analytics started and is now integrated on more than a million websites. Google Analytics is popular because it’s easy to use and provides meaningful and clearer reports. 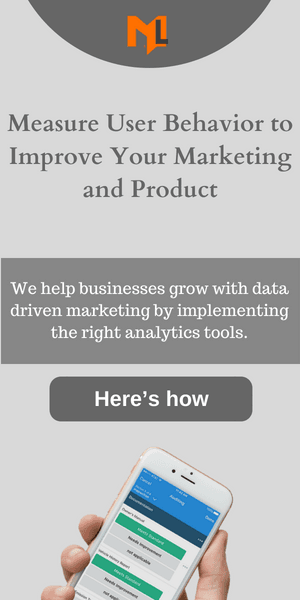 As the time passed, we saw the emergence of many analytics tools like Kissmetrics. These tools emerged to help integrate more complex things like event tracking and funnel analysis more easily than how it’s done in Google Analytics. In this article, you will get a free infographic displaying the comparison between Kissmetrics vs Google Analytics and few important features that Kissmetrics are good at. The above infographic demonstrates a clear comparison between Kissmetrics and Google Analytics and should get answers to most of your questions, but let’s take a look at few of the Kissmetrics features that might help improve your business strategy. At its core, Kissmetrics analytics is focused on people. Every single pageview is tied to a unique user, and not just a browser or cookie. The reason most people use Kissmetrics is that of its core functionality, people tracking, which in Google Analytics is a feature, and requires advanced knowledge to implement. Read more about how Kissmetrics and Google Analytics track people to better understand the tracking process. Kissmetrics doesn’t provide a built-in feature for A/B testing but it can be integrated with other third party tools like optimizely. The good thing about Kissmetrics is that you can easily build reports by importing data from the third party tool. The reports are better in the sense that it displays a cool comparison of the variations and decides the winner. Similarly, Google Analytics also imports A/B test data from third party testing tools like Google Optimize and displays the test reports. Activity report in Kissmetrics helps you drill down the actual reason for the trend. It gives you a quick way to visualize your events and see which segments are contributing to the trend. In this report, you can see a specific event and drill down to see what’s driving the trends. For example, a spike in direct traffic is a common issue in Google Analytics and without having a good knowledge it’s not easy to find the reason. With Kissmetrics you can easily drill down to see the actual cause that increased direct traffic. Google Analytics enhanced ecommerce tracking allows you to see the customer behavior towards the purchase funnel, create an audience for people who added products to cart but didn’t purchase. What would you do with this audience data? You can somehow use that audience for Adwords dynamic remarketing and that’s it. With Kissmetrics, you can target those specific people with an email, reminding them about their activity on your site and complete the purchase. In a nutshell, Kissmetrics isn’t just a reporting tool but can also take action based on data to improve your business. Kissmetrics allows you to define a segment of people that are most important to your business. Each specific segment is known as population. Kissmetrics can track the behavior of each population and highlight the changes. For example, you can create a population of people who have a monthly subscription or a population of people who have purchased less than $100. You can then monitor how they behave in future. You might have migrated to Google Tag Manager for setting up Google Analytics events. It is because setting up events in Google Analytics requires adding the specific event codes on your website. This is an intimidating process for people without a good programming experience. With Kissmetrics, you can easily set up events and nearly everything in Kissmetrics is centered around events. Once you set up events, you can then setup funnel reports, cohort analysis, people reports and A/B test reports. Kissmetrics provides a better way to search for people who have similar characteristics. You can create a people search based on events, property and identity. You can use the people search to re-engage their behavior to find common actions that drive engagement or conversions. Although Google Analytics can not provide as such reports like Kissmetrics, but it delivers a broader traffic report. It would be a good choice to have Google Analytics along with Kissmetrics to keep track of other important reports that Kissmetrics lacks.